This Mandatory Declassification Review contains material on President Lennart Meri of Estonia. 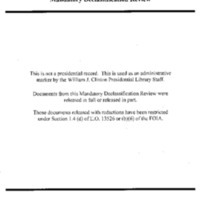 Materials include a memorandum of conversation between President Clinton, President Meri, and President Ulmanis of Latvia on June 25, 1996. Also included are letters between the two Presidents and background papers for a January 1998 meeting.